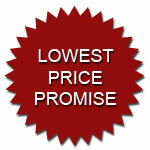 PowerLinkPlus+ offers all customers our Price Promise as we are confident that we will not be beaten on price. If you see the same product advertised at a lower price including delivery and in stock we will endeavour to match the price then beat it by 10%. Simply call our sales team with contact details of the supplier or web-site that you have seen the product (s) at a cheaper price and let us do the rest. This offer does not apply to prices you have been quoted for seconds or bulk orders and a proof of the offer may be required. We will consider all requests, however, any prices will be offered at our discretion. We reserve the right to refuse to match or beat a price at any time.